For over 20 years Niteowl Computing has been serving the computer industry as a Web Designer, Computer Consultant and Network Administrator. Our primary focus for that duration has been web site and graphic design. We draw upon our expertise as a print graphics professional and help you take your E-commerce business plan and develop it into a business reality. Our goal at Niteowl Computing is to help your business succeed. Through our catalog of Web services we offer various types of site designs. These include everything from a simple information pages to a full-blown database driven E-commerce site. We also provide FTP, hosting, and E-mail account services. From a small startup business, to one that is succeeding and just needs a little push over the top we can help your business achieve its GOALS. We don't stop at web site design. 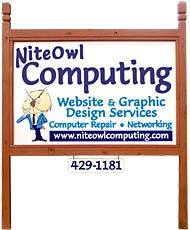 Niteowl Computing can administer and service all your computer based needs. These services include Network Design, Hardware installation and repair, software troubleshooting, and Anti-virus protection and removal. We also design automated functions to help with Data backup and recovery. If you have a computer based need we have a solution. To see how Niteowl Computing can help enhance your business, please follow the links through to a more thorough list of our Web Services. The opening of our new office in Sevierville/ Pigeon Forge. Please click here to view some of the Local Services we can offer. With the opening of this office, we are now able to service your local computer needs. Whether it's Website or Graphic Design, Computer Service, Network Setup or Administration, we are local and available to be there when you need us. Send mail to NiteOwl Computing with questions or comments about this web site.